Saturday morning found us at Otago Farmers’ Market, bright and early and ready to battle their resident portable kitchen. Alison Lambert puts on a fantastic seasonal cooking demonstration at the Market every week, and along with her husband Simon was well prepared to show us how it’s done! We thought we were up early, we were going to be set up and ready by the time everyone else even woke up, really psyche out the competition …. but turns out Alison was already there. The epitome of calm and collected – she puts us to shame 🙂 Talk about dedication to the cause, this woman is a real local cooking hero, supporting the producers at the Farmers’ Market and educating all her cooking fans about the ins-and-outs of seasonal cooking every week, rain or shine. 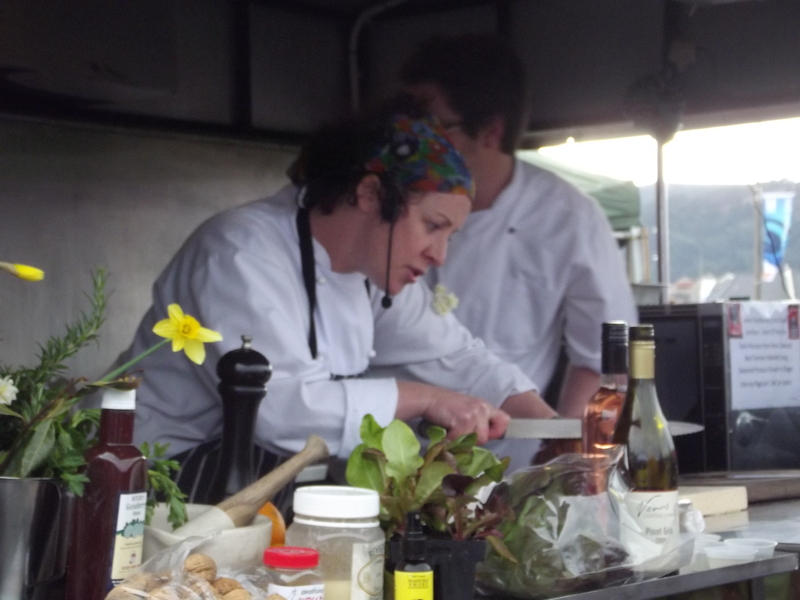 If you ever get the chance to visit the Otago Farmers’ Market and see her in action, do it! 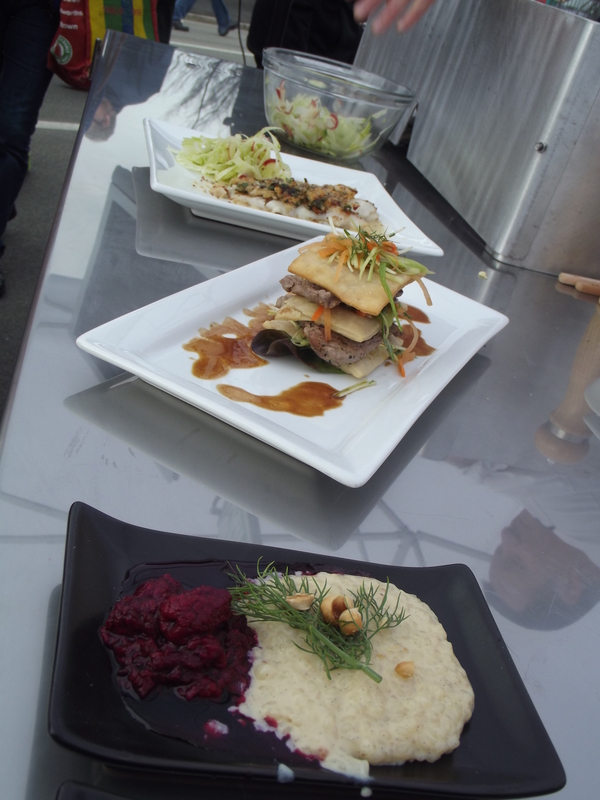 On the Out Standing Kitchen, we had Steve Ellwood and Tony Heptinstall from Otago Polytechnic, two very talented and entertaining chefs – I can’t help but be a little jealous of the cooking students who get them as their teachers! Check out the video for just a few of the laughs we had during the morning. Our Out Standing VIP judges with the tough task of picking the winners were John Marable, Angela Anderson and Jane Soper, and it was a very close call – One vote for the Otago kitchen, one vote for the Out Standing kitchen, and one squarely on the fence. Perhaps we will need a rematch one day to find a clear winner? 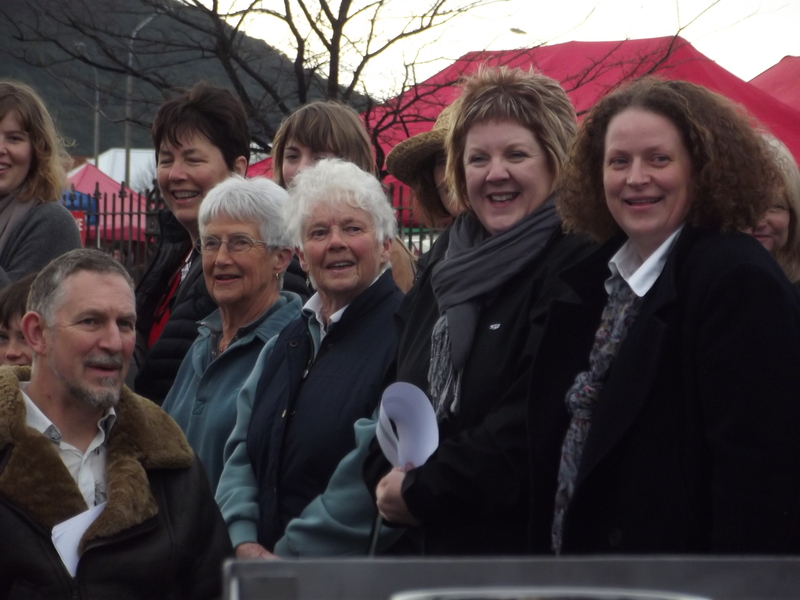 Cheers for stopping by, our next update will be all about Oamaru’s inagural Farrmers Market – see you then! EDIT: Check out Lisa’s (blogger from Sunday Hotpants) post about this event too! She’s whipped up a recipe for a Waimate Strawberry and Sonia Apple Fruit Sponge Pudding inspired by Alison and Simon.